Summary: Trusty old laser. That thing can stop regeneration. It's a glorious weapon, really. Summary: Every day, Jack tries to convince himself this is real. And every day, doubt creeps into him again. Summary: He just needed a moment, get some rest first. Rest that was impossible to come by, with a million deaths and revivals flickering through his memory, the Master's voice still ringing in his ear. public_call is a secret santa fic exchange for Doctor Who and its various related fandoms. All Whovian canons are welcome. Nominations for relationships are open. Summary: "Don't remember where you put it?" - The Doctor is looking for something. The TARDIS is showing her everything but. And Jack comes face to face with a memory. Hi everyone! Have some Bill Potts! Doctor/Jack Summer/Winter Holidays - sign-ups open! Every summer, we're throwing a Doctor/Jack party at wintercompanion. Over the course of a month, we post new fic and art created to a prompt list kept secret until the month starts, and then all of the prompts are opened to everyone. Interested? Come sign up here! Sign-ups are open until 29 June. Prompt selection emails will go out over the course of the week; assignments will be sent no later than 1 July. 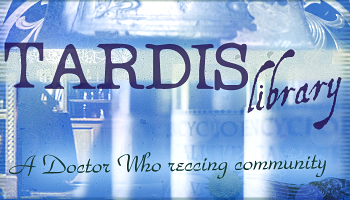 tardis_library - a new reccing community for Doctor Who and all related fandoms for all fanworks. Members can post recs at any time but there are also be monthly themes and seasonal challenges. Summary: "You fell," Missy said blandly. - "What, right into your arms?" A/N: Set directly after Twice Upon a Time. Summary: Damn Jack for playing hard to get now, of all times. - Set towards the end of The End of Time. Summary: He asks her to stay; she leaves instead. A/N: Set toward the end of The Doctor Falls. Summary: Missy and the Vault. Missy and one of her victims, a.k.a. the TARDIS. And always, Missy and the Doctor. Summary: How can I save them when I'm lost to the dark? A/N: Set at the end of Extremis. Summary: "Isn't it obvious?" Missy said brightly. "Since you've taken the part of the villain, I had to go and play the hero." Summary: "Forging blindly ahead is a well-honed strategy of mine," the Doctor admitted wryly. "I can do that any day. Now, forward? That's proven a bit more difficult, you see." public_call is a secret santa fic exchange for Doctor Who and its various related fandoms, run through LJ/DW and AO3. public_call is a secret santa fic exchange for Doctor Who and its various related fandoms, run through LJ/DW and AO3. Participants sign up to write a story of at least 1,000 words involving a relationship between two or more characters someone else has requested. In return, they receive a story of at least 1,000 words with a relationship they have requested.